Social media marketing is the need of time and industry. Websites are getting the traffic through the social media platforms and is playing a pleasant role in the journey of the company. Here we have stated the role of social media and different social media platforms in running a business and how the companies are utilizing the platform in increasing their user engagement and sales. 1) In an interesting research it came out that by the year 2020, customers will manage 85% of their relationship without talking to a human. This will be a great achievement for the digital marketing industry. 2) The number of SMEs is increasing and so as their marketing strategy. A report states that out of 10 SMEs, 8use social media for their business to drive growth. 3) 46% of the total web users look towards social media while making a purchase. 4) 3out of 5 SMEs agreed to the fact that they have gained new customers using social media. 5) 70% of B2C marketers have attainedtheir customers through Facebook. 6) Out of the different types of posts on Facebook, 75% photos and 10% links are posted by the companies. 7) More than 90% people on Twitter say that they follow businessman on Twitter to get discounts and coupons. 8) 83.8% of luxury brands have a presence on Pinterest. This increases their sales and increases the user engagement over the website. 9) Out of the entire companies using digital marketing, 71%has planned to raise their digital marketing budgets this year, by an average of 27%. 10)67% of marketers say running digital marketing campaigns to increase sales is a top priority this year. 11) Out of the entire ad market in 2015, internet advertising will cover up 25%. 12) A surprisingly report says that videos on landing pages increase conversions by 86%. 13) 85% of B2B buyers agree that companies should present information via social networks. 14) And yet only 20% of CMOs are using social networking to engage with the customers. 15) In 2015, the marketers will spend $8.3 billion on social media advertising. 16) “Interesting and fascinating content” is one among the top three reasons why people follow brands on social media. 17) 87% of B2B marketers use social media to distribute content and 17% of marketers have planned to increase podcasting efforts this year. 18) Social media marketing budgets are projected to double over the next five years. 19) 78% of companies now say they have dedicated social media teams, up from 67% in 2012. 20)The top three social networks used by B2B marketers are LinkedIn (91%); Twitter (85%); and Facebook (81%). 1) Facebook accounts for 15.8% of total time spent on the Internet. 2) 71% of online adults use Facebook. 63% of Facebook users visit daily and 40% visit multiple times per day. This is a huge space for the digital marketers to capture the market through this vast audience. 3) More than a third (36%) of online adults use only one social networking site. Of these, 83% use Facebook. 8% use LinkedIn. 4) One million web pages are accessed using the “Login with Facebook” feature. This is due to the incredible increase in the popularity of Facebook. 5) Nearly a quarter of Facebook users login at least five times per day. 1) Not surprisingly, LinkedIn is the top social network for B2B marketing. 83% of marketers say they prefer to use LinkedIn for distributing B2B content, and above 50% of vendors say they have produced sales through LinkedIn. 2) The average time spent on LinkedIn per month is 17 minutes. 3)Out of the 100 companies listed in Fortune magazine, 91 companies use LinkedIn for candidate searches. 3- How to decide upon right Internet marketing mix? 1) The average time per month spent by users on Twitter is 170 minutes. 2) Only about half of the people who log in to twitter once a month actually tweet. Others are just like hidden. 3) Paradoxically, the most-followed brand on Twitter is…Youtube, with more than 50.9 million followers. Twitter is #3 after Instagram. Google is somewhat unfortunate as it comes on number #19 with 11.1 million followers. 4)Not a shock: retailers and restaurants are the most engaging industries on Twitter. Surprising: apparel brands are the least engaging. 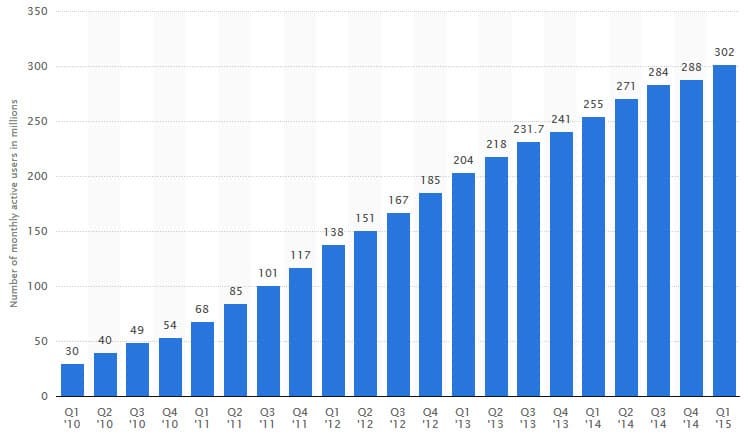 5) Twitter now has over 646 million registered users, and 302 million active monthly users. 34% of marketers use Twitter to successfully generate leads.